The word exhausted doesn’t even begin to describe how I feel right now. But I’ve always been of the mindset that being busy is good. But being so busy you feel crazy doesn’t often feel good, but it is so much better than having absolutely no work to be done and crying because you are bored and without work. So, I am in no way complaining, I’m just feeling a little tired is all. All that said, I found this word of advice from Judy Blume and I thought it was absolutely perfect for how I’ve been feeling these last few days. 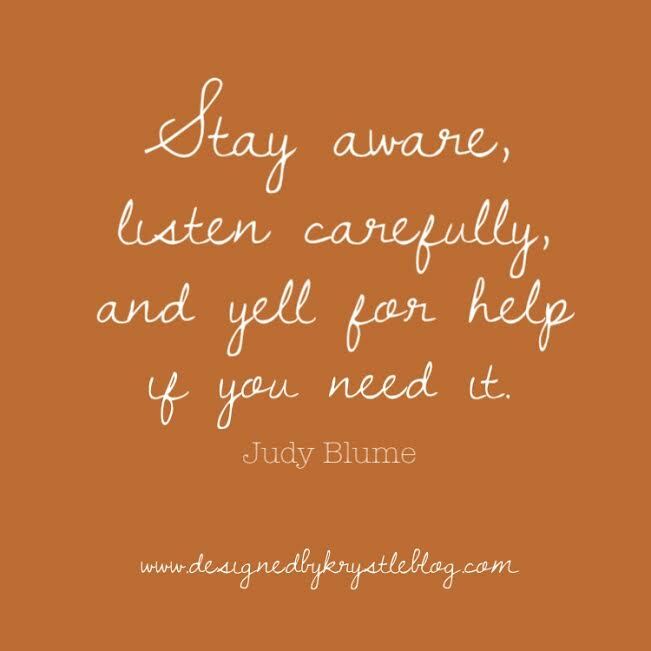 “Stay aware, listen carefully, and yell for help if you need it.” Well Judy, My ears are perked, I’m paying attention, and I’m just about ready to yell for help!! I know I owe you all an announcement on who won the Appleton Wrap Dress contest, but I haven’t had a minute to determine a winner yet, so just know that the contest is closed and I will announce a winner later on tonight or in tomorrow’s post, and I appreciate you baring with me on this one! How was your weekend? Did you do anything fun? Or were you fortunate enough as I am to be bogged down with getting work done? Tell me what you’re up to! Let’s be social! Follow DBK on Instagram, Twitter, Facebook, Pinterest and Bloglovin’!